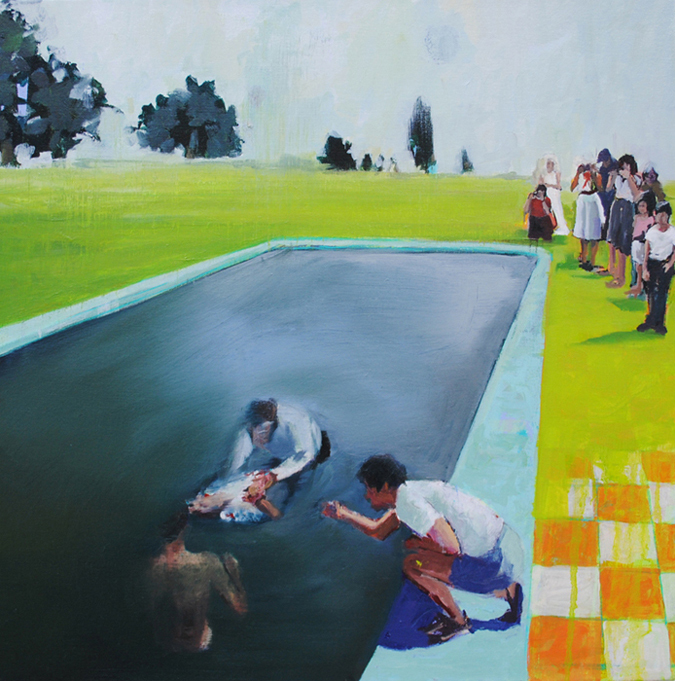 Pool Party, 2011 Oil on linen 20 x 20 in. Detroit Vacation, 2102 Oil on canvas 30 x 30 in. 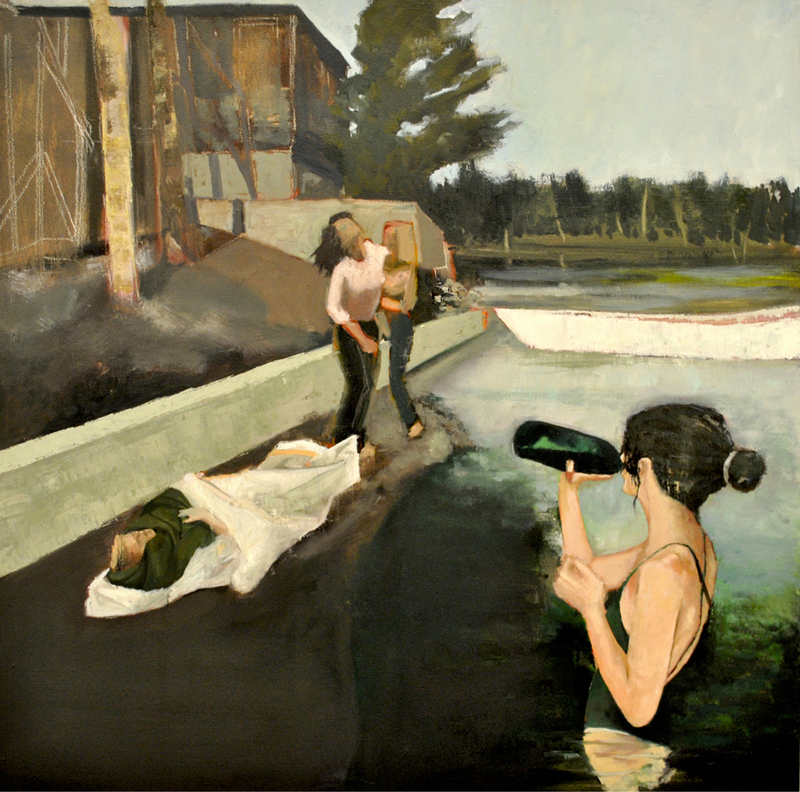 Bottom's Up, 2012 Oil on linen 30 x 30 in. 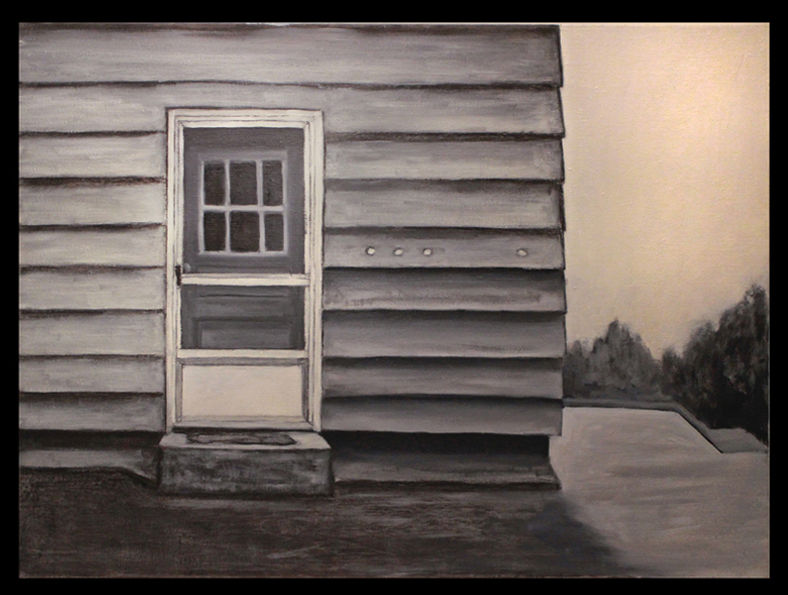 Knock, Knock, 2015 Oil on linen 24 x 36 in. 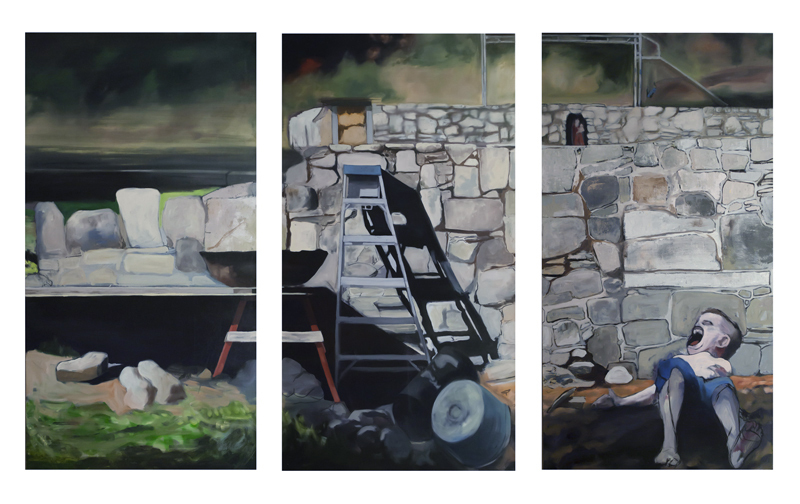 Shepherd's Hill, 2015 Oil on canvas Triptych, each painting 36 x 68 in. 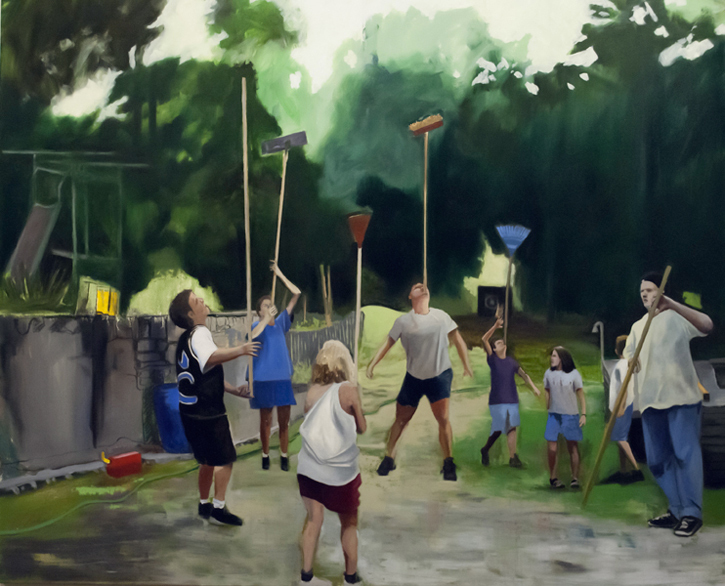 The Birthday Party, 2015 Oil on canvas 60 x 72 in. A painting can be a trigger for the forensic imagination that examines nuanced and intersectional truths. As an artist, I ask, what role do aesthetics play in the representation and interpretation of truth? I do this through a studio practice called that synthesizes the material properties of pigment and multispectral photography. My paintings are distinguished by an uncanny familiarity that exists between observational and lens-based painting. 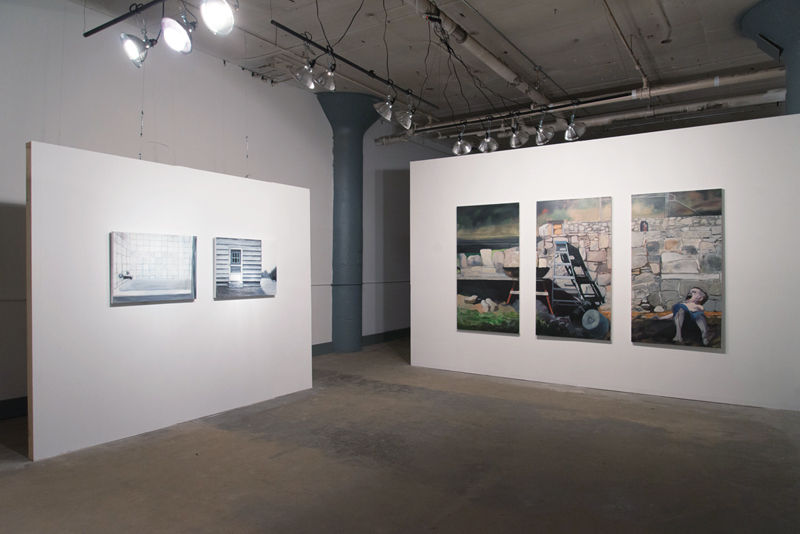 Compositions for paintings originate from a personal archive of objects, mass-media images, and personal experiences. These sources unite public life with private thought and evoke stories that become transformed by the act of painting and analysis. Parties and gatherings located in rural or suburban America are a recurring motif. 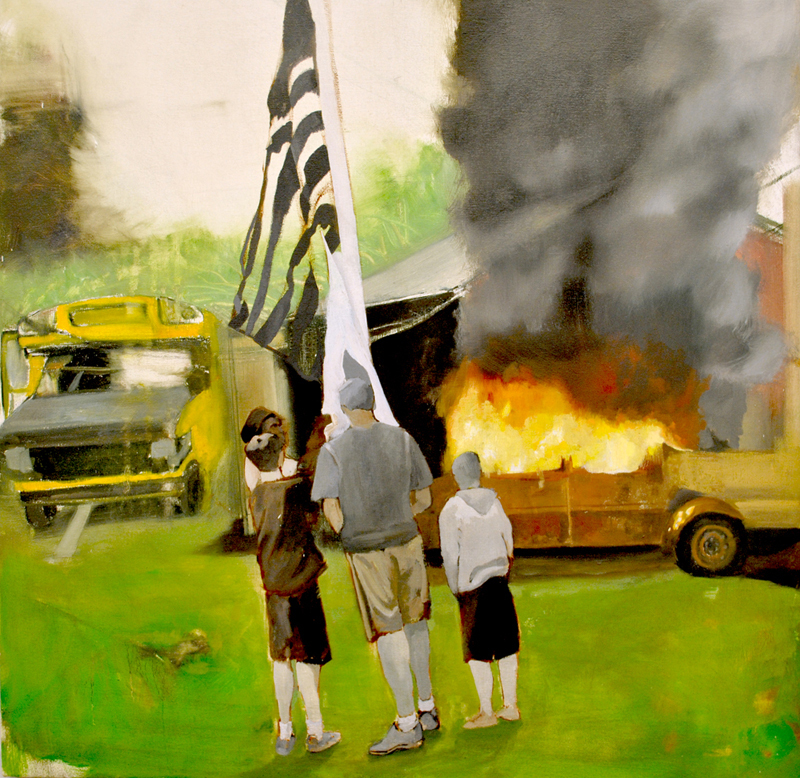 The scenes are intended to be psychologically ambivalent, capturing the decisive moment before or after an event. The position of the characters plays an important key to reading these paintings. Sometimes the characters are grouped closely but unaware of each other and other times they are far apart but fixated on each other’s behavior. 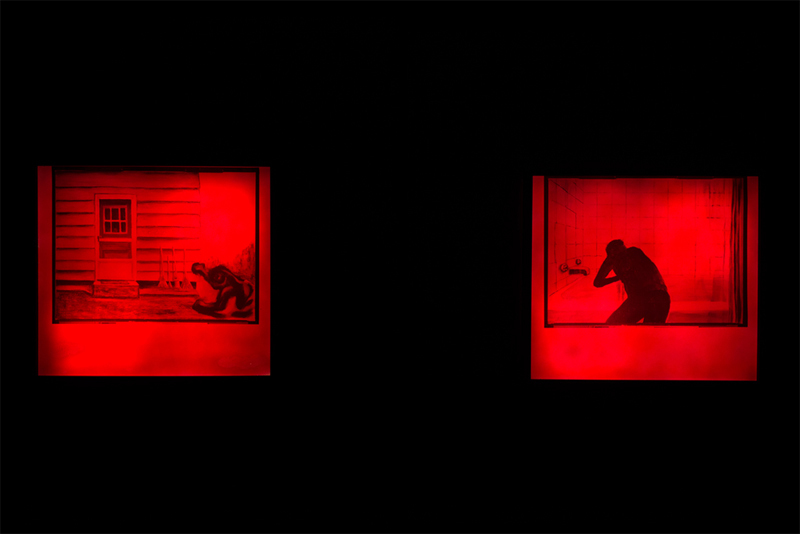 Their positions are a critique of the paradox of contemporary human relationships where denial and suppression thrive among increasing openness and interconnectivity. These concerns have motivated my recent project, Forensic Painting, as a process to reveal and relieve these tensions by tracing back to their sources. Forensic painting is a process that merges traditional oil painting with multispectral imaging such as radiography and digital infrared. The painted layers are composed in a sequence that takes advantage of the light-sensitive qualities of pigments when interacting with extra-visible wavelengths of light. Fine art conservators use multispectral imaging to investigate the material properties of a painting and reveal how the painting was created. They do this to determine how to best treat a painting but also to determine authenticity. This process shares operative characteristics with other object and material-based forensic investigations ranging from paint analysis collected from a car collision to data retrieval on a damaged hard drive. Like these examples, painting is also a storage device, a material witness with retrievable memories, retraceable actions, emotions, and meaning. 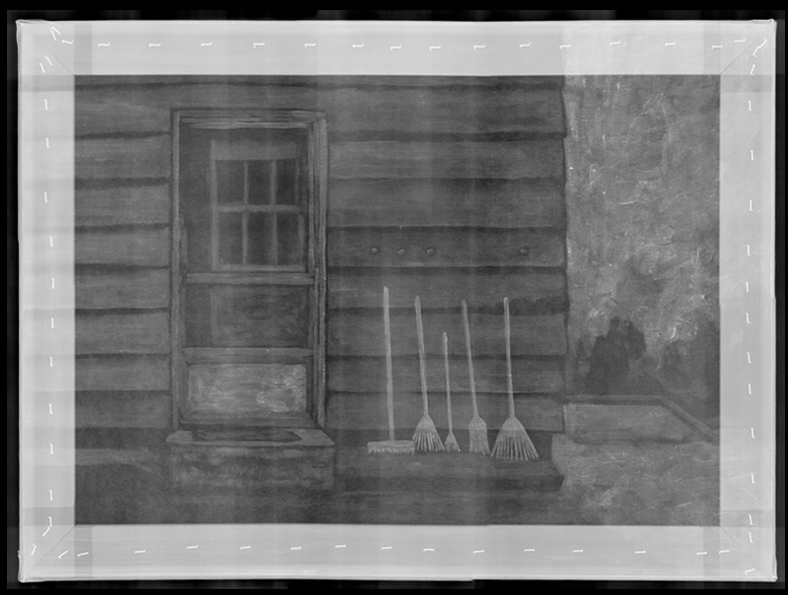 The forensic painting process builds distinct image environments on separate layers that are exposed by forensic photography. 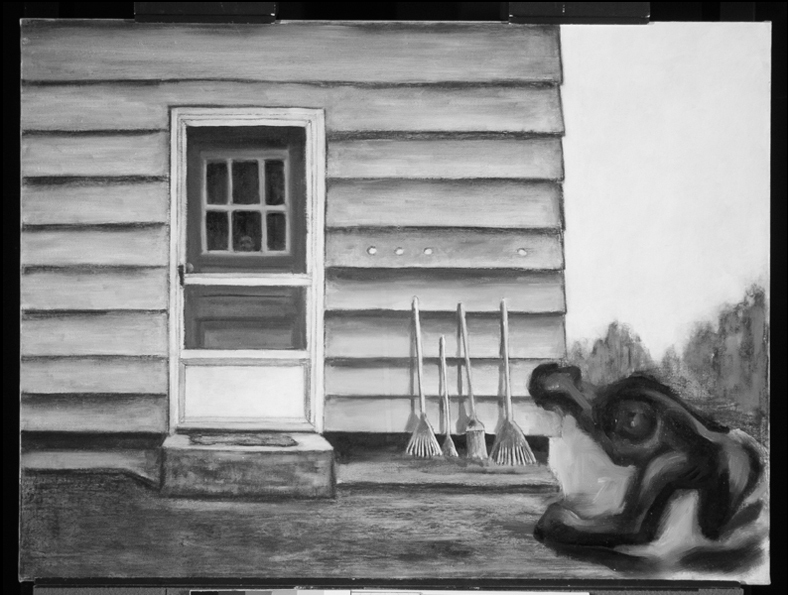 The finished painting and corresponding photographic evidence creates an event that is reconstructed in the minds of the audience. This cognitive reconstruction of an event is the forensic imagination in action. An imagination that creates meaning across media, adding time, causality, and complexity to the people and places that are depicted. Contemporary America can be defined as a post-truth society. Challenged by alternative facts, the battle over reality and factuality is raging. How is a fact defined? What is a credible source? How do we determine authenticity? As an artist, I am also asking; what role can artwork and aesthetics play in the representation and interpretation of truth? Forensic imagination and more broadly forensic aesthetics have a significant role in this debate. Aesthetics, by etymological definition, is the study of the senses. We rely on sensory information to determine facts. We use our senses to make sense of the world. When used in the forum of public truth, aesthetics become an expansive mode of presentation that many fields of knowledge and human enterprise use to establish credibility and value, exercise power, and deliver judgment. This is the field of forensic aesthetics. Given the historic threats that art and aesthetics have faced, from the culture wars of the 1990’s bookended by repeated threats to eliminate the NEA to persistent defunding of arts education in public schools that have contributed to a pervasive philistine social climate, the stakes are incredibly high. It is the responsibility of the artist, curator, art historian, and viewer to engage the forensic imagination to understand the physical history of an object and the events that shaped it, as well as the conceptual and ethical ramifications that an object holds. This approach is a decisive action away from superficiality as an ironic endgame and towards a humane criticality that values self-awareness and responsibility to each other and our environment. 2017 The Witnessing Event, Curator: Rashmi Viswanathan, El Museo de Los Sures, Brooklyn, NY. 2017 Brooklyn’s Finest, Curators: Elodie Castaldo and Chloe Angiolini, Holyrad Studios, Brooklyn, NY. Keith Powers, Gallery X mounts intriguing show of portraits, “About-Face’.